Sinanglay na Barramundi, barramundi fillet wrapped with bok choy and cooked with coconut milk. barramundi or Asian sea bass is one of the more popular fish in Australia. On most Australian supermarkets and fish shops they are usually sold cleaned filleted without or with skin on. I love seafood and I have been thinking what is the best Pinoy method of cooking the fish. A lot of barramundi fish dishes are in my mind but but most of them I don’t have the proper material or the right ingredients. Well I guess I have to do with the available ingredients locally. 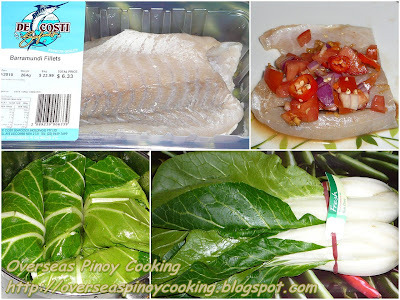 For my Sinanglay na Barramundi I used skinned barramundi fillet and Chinese bok choy which is also very abundant here. It might have been better also if I have bought barramundi fillet with skin on. To make the dish I used a lot of chopped tomato, onion, ginger, some red and green chili and mixed with sampalok sinigang mix and fish sauce. The salsa is then rolled into the fish fillet then wrapped with the bok choy then stewed with coconut milk. Here is the recipe. In a bowl mix the onion, tomato, chili, spring onion, ginger and mix in the fish sauce and sinigang sampalok mix and divide into four parts. Lay a piece bok chop then the barramundi fillet in a large platter, this is required to catch the salsa juice, then place 1 part of the prepared mixture over the fish fillet and roll the fish over the mixture, add more of the smaller bok choy then wrap the rolled fish with the bok choy you, may use more bok choy to fully wrap the rolled fish. Now carefully lay the wrapped fish on a stewing pan. Repeat process on the rest of the ingredients. Pour half of the coconut milk over the wrapped fish on the pan and add about 1/2 cup of water. Pour also all the trapped mixture juices during wrapping on to the pan. Bring to a boil and simmer at moderate heat for 15 to 20 minutes until most of the liquid has evaporated. Correct saltines if required. Pour the other half of the coconut milk and simmer for another 5 to 10 minutes or until the sauce is reduced to creamy consistency. Serve with rice and fish sauce with hot chilli. this is interesting... it look like the Visayan Pinangat. Only we use Taro leaves as wraps. This is really good. This website is like digging a treasure. Cheers! Yes the original dish use taro leaves, pechay is also good substitute, once again thanks ziggy. Taga rinkonada ka tabi? great recipe!